Bicycle Zombie Playing Cards are a standard Bicycle Deck that's been infected! The Court Cards have Zombies on them and each of the 52 Cards in the Deck features tips on how to survive a Zombie attack. Bicycle Zombie Playing Cards are Poker Size. They are the same superior quality as regular Bicycle Decks. 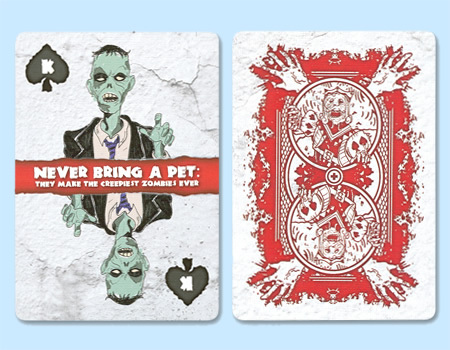 Zombie Playing Cards are made in the U.S.A. The cards have Bicycle's world renowned air-cushion finish and softly beveled card edges. For more information or volume pricing on Zombie Playing Cards from Bicycle, please contact us at 1-800-233-0828.